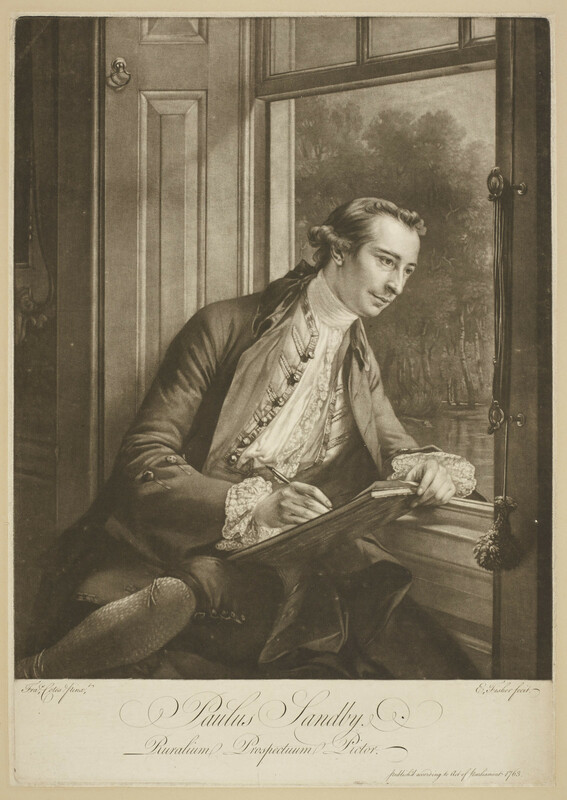 A mezzotint after a portrait of Paul Sandby; three-quarter length, seated, inclined to the right as he draws the view from a window, the sill of which he leans upon. Inscribed: Fra.s Cotes pinx.t / E. Fisher fecit. / Paulus Sandby. / Ruralium Prospectuum Pictor / Published according to Act of Parliament. 1763. Paul Sandby (1731–1809) followed his older brother Thomas as a military draughtsman to the Board of Ordnance, based at the Tower of London but mainly engaged in surveying the Scottish Highlands following the suppression of the Jacobite Rebellion in 1746. Their patron William Augustus, Duke of Cumberland, was Ranger of Windsor Great Park, and he subsequently made Thomas his deputy, a position he held for the rest of his life. Thomas and Paul thus spent much of their careers in and around Windsor, producing many views of the Castle and Park in watercolour and bodycolour. In 1761, the date of Francis Cotes’s painted portrait (Tate, London) reproduced in this mezzotint, Paul and Thomas were among the founders of the Society of Artists of Great Britain; in 1768 they were both likewise founder members of the Royal Academy of Arts. A desire to raise the status of artists is implicit in the present portrait, which shows Sandby elegantly dressed in a lace-trimmed shirt, an informal frock coat, a silk waistcoat, stockings with tight-fitting breeches to the knee, and his hair set into curls and tied back with a silk ribbon. He leans out of the window of a well-appointed house, his face illuminated by daylight as he draws from nature with a porte-crayon on a sheet of paper supported on a bound volume. (On light symbolism in this portrait see Shawe-Taylor 1987, p. 27.) This gentlemanly air extends to the inscription below, in Latin rather than English, describing Sandby as Ruralium Prospectuum Pictor (‘painter of rural views’), with ruralium implying leisured activity (rather than rusticum, with its flavour of peasantry and farm-work).